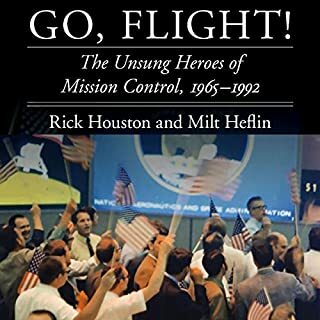 Using interviews, NASA oral histories, and recently declassified material, Into the Black pieces together the dramatic untold story of the Columbia mission and the brave people who dedicated themselves to help the United States succeed in the age of space exploration. On April 12, 1981, NASA's Space Shuttle Columbia blasted off from Cape Canaveral. It was the most advanced, state-of-the-art flying machine ever built, challenging the minds and imagination of America's top engineers and pilots. This is the story of a unique American hero who came of age as an astronaut during the few dramatic years when man reached the moon. Cernan's career spanned the entire Apollo program, from the tragic fire that killed three of his comrades on Apollo 1, through the moment when he left man's last footprint on the moon as commander of Apollo 17. Much has been written about Neil Armstrong, America's modern hero and history's most famous space traveler. Yet, shy of fame and never one to steal the spotlight, Armstrong was always reluctant to discuss his personal side of events. Here for the first time is the definitive story of Neil's life of flight he shared for five decades with a trusted friend - Jay Barbree. Best book I've read in years! ‘It didn’t matter that they were now three miles beyond their target site, that communications were dropping out and that they were running low on fuel. All that mattered to Neil as he searched for a safe spot to land was that boulders littered the surface below. “Thirty seconds,” called mission control. In truth, the flight controllers were now no more than spectators, just like everybody else. No more needed to be said. It was down to Armstrong. ’It was the ultimate journey and the last great adventure, but no one knew if they were coming back. On 20 July 1969 millions of people around the world held their breath as a human being looked back at them from the surface of the Moon. Yet who were these men risking so much while the world watched? How did the passionate Buzz Aldrin, inscrutable Michael Collins and enigmatic Neil Armstrong learn to depend on one another as they endured the most intense period of their lives? From the personal tragedies and triumphs they encountered along the way to the mission's terrifying climax, Moon Shot – now also a major TV factual-drama – draws on interviews with many of the leading participants and hundreds of hours of archive material to tell the complete and compelling true story of an event that captured the imagination of generations, then and now. Parry's book is extremely well structured. He keeps the story of the flight of Eleven going, with alternating sections of equal length to fill in the necessary background information. The editing is crisp, and all of the important facts - including some I had either no previous knowledge of, or had failed to understand clearly before - are concisely covered with no fluff. Parry did his homework very thoroughly; his source material was probably tomes, yet he manages to brings the sheer complexity of the mission into clear focus, in less than 11 hours of audiobook time. The use of actual quotes by the astronauts and mission control guys is a real treat. The quotes are integrated seamlessly, and add much to the feeling of immediacy of the book. I loved how well the author conveyed the dramatic moments - and there were some nail biters! John Chancer's narration is also spot on. I notice that "Rocket Men" has several positive reviews. It's a great book, I recommend it, but it did not keep me on the edge of my seat like “Moon Shot”. Five well-deserved stars. Dan Parry supplies a direct and appropriately detailed story of the Apollo 11 mission to the Moon with the historic first man on the moon event. Parry interweaves the background story for Neil Armstrong, Buzz Aldrin and Michael Collins with the chronological sequence of events occurring during the space flight. Well researched and well written, this book flushes out the many hazards and challenges that occurred during the training and execution of this mission. Of course, the 8 day mission culminated with Neil and Buzz stepping on the Moon on July 20, 1969. Parry keeps the readers interest with accounts of the amazing X-15 rocket plane, Lunar Landing training, Soviet gamesmanship and the dozens of other sub-plots occurring during the space race. I give Moon Shot a good read. 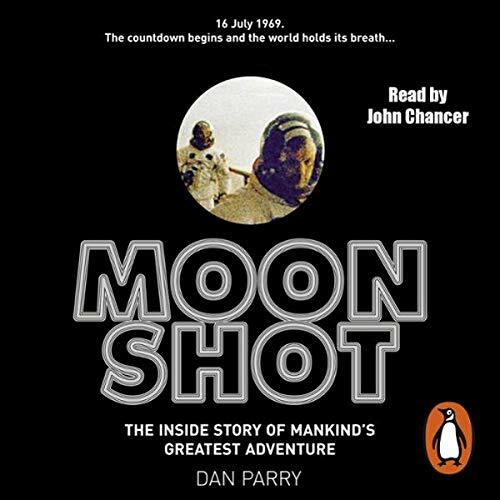 I listened to Moon Shot on an audiobook and I must complement the reader, John Chancer, for his smooth and engaging narration of the story. I give Moon Shot a good read. John Chancer did a great job narrating this book. Parry did an excellent job in researching all the massive amount of information to write this book and then put it into an suspenseful , nail-biting humanizing story. I found it amazing ALL the people that had to work together to solve some many problems form basic math and physics to engineering problems. Also the pilot's had to learn to fly in space. The pressure put on everyone to achieve Kennedy's deadline pushed everyone to achieve more than they thought they could. This is a great story and reading this should help a young person want to stay in college and study science. 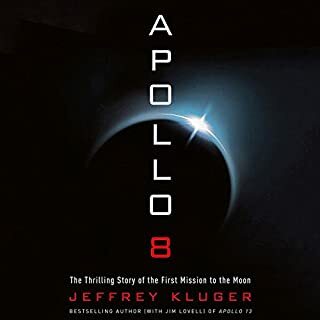 As someone who has read a lot about the Apollo program, this was a good but not a great book. It does not compare, for example, with A Man on the Moon by Andrew Chaikin. It struck me as a book written to take advantage of the 40th anniversary of the Apollo 11 landing. Still I found the narrative interesting and learned a few things I didn't know. However, it was clear the narrator had not lived during this time, and I was disappointed the author/publisher did not vet the narration better. The narrator would occasionally mispronounce words, such as the name of Wally Schirra or the pronunciation of the "Agena" rocket. He also did not always know which abbreviations were pronounced as acronyms and which were spelled out. When he would quote the astronauts directly and try to mimic their voices, the pitch of his voice would go up some, which I thought sometimes made Neil Armstrong sound like a teenager. Overall somewhat disappointing. Very easy to follow and interesting both times I listened to it! So many interesting technical factoids but not so many that it was too dry or too difficult to follow. A compact and dramatic history of Apollo 11. 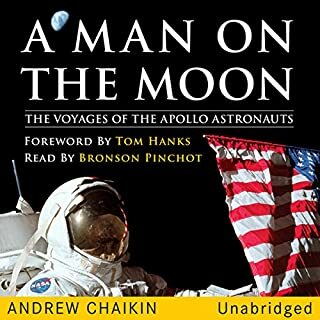 Not nearly as complete as Andrew Chaikin's A Man on the Moon, but this is a fine primer, in story form, about how astronauts landed on the moon in 1969. If you are already well-versed into the history of the American space program, you won't find anything new here. Superb summary of highly technical history. This well narrated presentation is a terrific retelling of the events. It could be a perfect introduction to the larger subject of space exploration for anyone who was not yet born during the original excitement of the moon landings. Thoroughly enjoyed this audiobook. The reader did a great job of bringing the text to life. Super book! I learned a lot and the time flew by as I listened. A detailed look into the Apollo missions. I learned a lot about the Apollo missions that I never knew. This is a must read for any person that is a fan of space flight. It breaks down in detail all the problems and hurdles that America had to overcome to land a man on the moon. It's very comprehensive. The book does get a little dry when dealing with the personal lives of the astronauts. 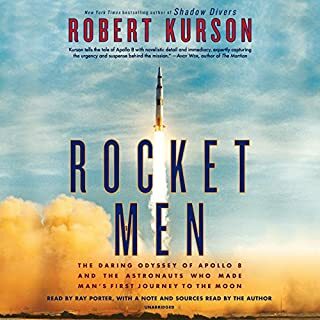 Excellently written and entertainingly narrated, Moon Shot strikes a balance between in-depth technical descriptions of the Apollo missions and the human story of the men and women involved. It documents one of the most monumental achievements in human history that everyone should appreciate and know more about. Balances the human and the science wonderfully. At first the jumping of the timeline jars but it makes more sense later on. Great listen to an amazing story. 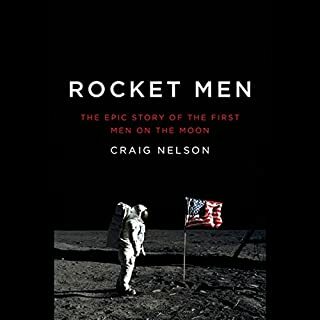 Really enjoyed this insight into the Apollo 11 Mission and the stories behind it. Interspersing mission highlights with back story kept things interesting without spoiling the flow. Listened to this on a long haul flight and would definitely listen again. The story is interesting and engaging and puts the meats on the bones of the story of the moon shot. What made the experience of listening to Moon Shot the most enjoyable? What other book might you compare Moon Shot to, and why? Would you listen to another book narrated by John Chancer? Maybe.....his impressions of Neil Armstrong started to grate quite quickly! I really enjoyed this book very much. 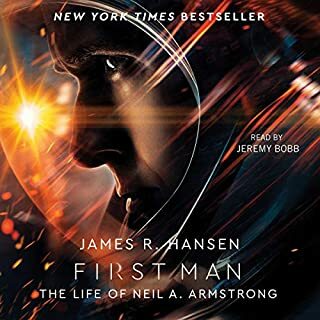 The story is such a great one and the characters so interesting, my only small reservation being the vocal characterisations that the narrator gave to the various protagonists; Armstrong was portrayed with a bit of girlish voice which was not the case. That aside, I found it really exciting and packed with nuggets of information and it's my favourite listen of the last few months.